The Gratitude In-Ear Monitors are one of Monster's newest in-ear headphones and continue Monster's trend of pairing up with celebrities to develop and market headphones. In the case of the Gratitude Monster teamed up with the musical group Earth, Wind and Fire. Notably, Earth, Wind and Fire had a very successful album with the name Gratitude in the late 1990's. 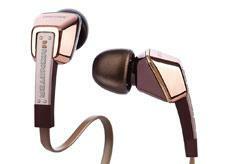 • Read more headphone reviews from Home Theater Review's writers. • Learn about how AV dealers should address headphones. In recent years Monster's recent headphone releases have risen to prolific levels and as such it can be hard to keep track of all their new headphones. I personally have not listened to most of the newly released headphones but am happy that I had an opportunity to listen to the Gratitude. The Gratitude headphone's are relatively solid and heavy with metal bodies finished in an attractive rose gold finish with a modern, angular design and complementary colored cabling and remote. The earpieces have a substantial heft with their sturdy, metallic bodies and appear to be well built as one would expect with their $229 asking price. The Gratitude come nicely packaged in a fold open box similar to Monster's Beats headphones. Opening up the package the Gratitude headphones are nicely presented above one of two carrying cases, a larger case with a fold over flap design. A smaller pinch style case is also provided and is the one I used. The Gratitude come with a total of 12 pairs of SuperTips in varying sizes to ensure a proper fit. Flat, tangle resistant cabling with Monster's ControlTalk microhone and remote round out the package. I used the Gratitude headphones for both listening to music and to make phone calls on an iPhone 4S. I did not have any problems being understood when using the ControlTalk microphone and voices were clear on my end as well. Read about the high points and low points of the Gratitude on Page 2.